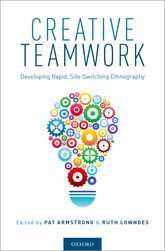 Ethics as Teamwork details how well-planned collaborative teamwork processes offer opportunities to develop an ethical research praxis that extends well beyond formal ethics reviews. The chapter provides an analysis of teamwork processes involved in the “reimagining” ethnographies and their impact on procedural ethics (formal ethics reviews), practice ethics (issues emerging while conducting the research), project ethics (issues related to the international, interdisciplinary, and collaborative project design). Processes identified include building consensus through meetings of many kinds, problem-solving consultation, team reflexivity and the use of discretion when democracy was not possible. Situating these processes within the frame of critical feminist research, the chapter makes links between these ethical processes and research that aims to create change.